The shady spots of the yard deserve just as much attention as the full-sun locations. Shade creates a difficult planting scenario for the gardener. Shade locations often feature drier soil and fewer nutrients to support plant life. Choosing easy-to-grow shade plants provides instant color to the shade garden provided that proper soil enhancement techniques provide an optimum growing environment. The brilliant purple flowers of the annual lobelia add a blast of color to the shade garden. Lobelia reaches mature size of about 6 inches tall and spreads to a 1-foot-wide mound. Foliage consists of small elliptical leaves in medium green hues. Lobelia produces flowers from late spring until the first frost in the fall. This tough annual tolerates partial shade and prefers rich soil. Different cultivars produce flowers in white, pink, indigo or mauve. Late-season pruning induces this plant to produce a second round of blooms. Use lobelia in the shade garden as an edging plant or as a cascading plant in rock gardens. Find a shady spot to plant a batch of tough annual impatiens. These prolific bloomers produce flowers beginning in late spring throughout the summer growing season. 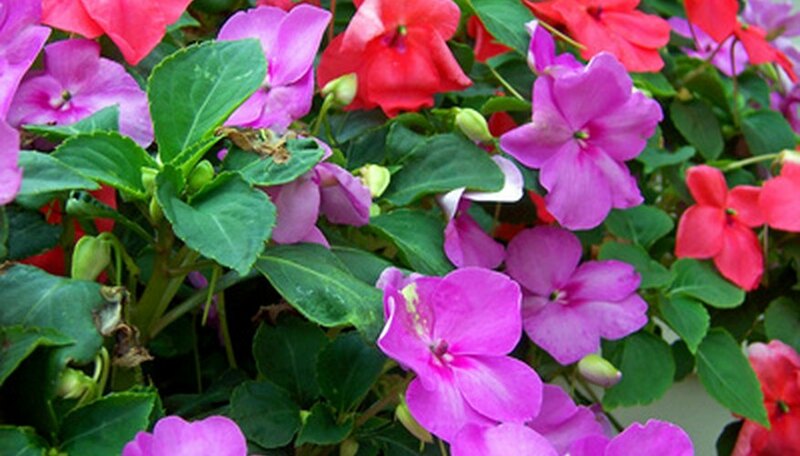 Impatiens grow in a mounded habit up to 24 inches in height. Plants spread easily in rich well-drained soil to form small bushes in the shade garden. Impatiens feature rounded foliage in a medium green color with slight indentations along the leaf edges. Flower colors include red, orange, pink, white, salmon, violet and rose. Impatiens work well as border plants or in shade container gardens. Gardeners don't need to remove blooms since this plant self-cleans spent flower blooms. Make sure to avoid the cultivar New Guinea impatiens when purchasing plants. New Guinea impatiens tolerate full sun locations and can be identified with distinctive variegated red/green leaves. A pleasing mounded shape characterizes the evergreen candytuft. The shade perennial likes moist, well-drained soils and reaches a mature height of 10 inches. Mounds reach widths of 2 feet and feature lance-shaped, dark green leaves. Candytuft produces thick blankets of white flowers that encompass the entire plant in mid-spring to lend color to the early spring garden. Gardeners prize evergreen candytuft for the beautiful foliage and spreading growth habit. Plant evergreen candytuft in USDA hardiness zones 3 to 9. For best flowering results, prune blooms off stems immediately after blooming finishes to promote plant health and abundant blooms the following season.